Thanksgiving is right around the corner, so I have been trying out a whole bunch of new recipes to get prepared. I just love homemade stuffing and I wanted to try to make it myself. I will let you in on a little hint my grandma taught me. Whenever you are cooking with bread, let it sit out overnight so it can stale. This way it won’t turn too mushy when you add liquid. 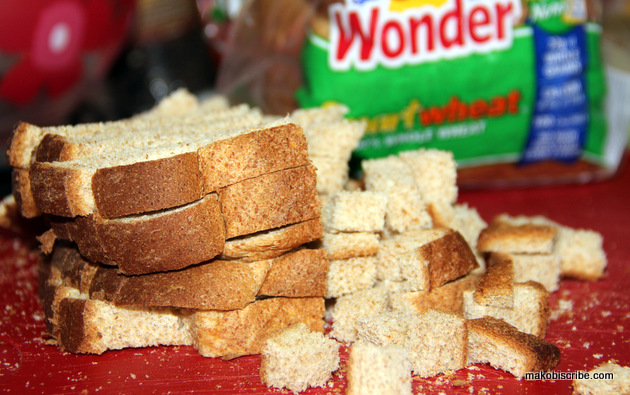 I sliced the bread rather thin and then cubed it. Once it is stale it is easier to cut also. This looks delish. Cranberry stuffing is one of my favorites. I love the combo of sweet and savory! we love all things cranberry!